Garlic bread is a favorite to almost all of us.Serve this along with Italian pasta/spaghetti and a healthy dinner is ready in minutes. You can serve this with Spaghetti Bolognese. 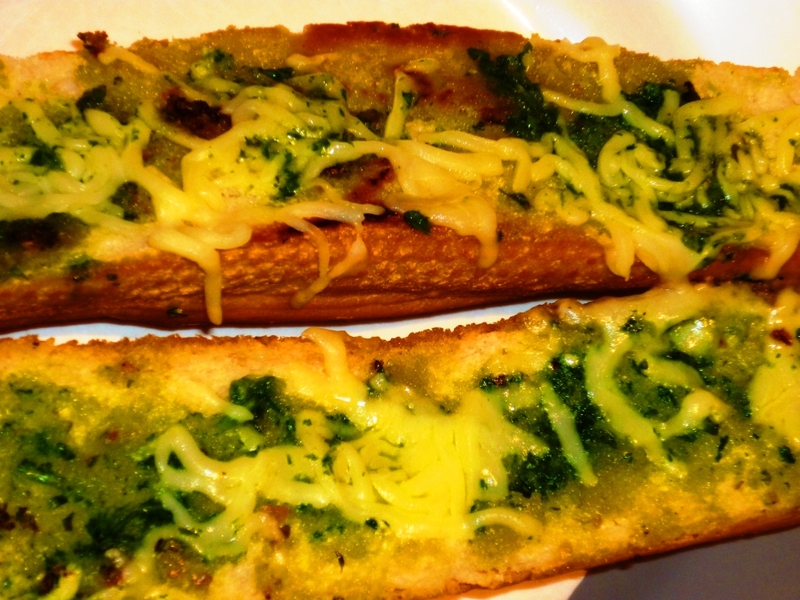 Here I have made cheese garlic bread.Avoid cheese and it is still very tasty.Since we are using Olive oil,we can cut some calories there too. 1.Cut Baguette into 2 halves.Now slit each half longitudinally. Blend garlic cloves,a pinch of salt and parsley with 1 tbsp olive oil. Make a fine paste.You can store this paste refrigerated and can be used in many other recipes. 3.Apply this paste on the bread and toast it in an oven at maximum temperature.You can toast on stove top too. When it turns light brown ,add plenty of cheese(salt and pepper if you prefer) and cook until cheese is melted and bubbly. Serve hot with Spaghetti or Lasagna.